Tomorrow is Easter. We live in a world where Easter has evolved from a Christian holiday to a holiday of Easter bunnies and egg hunts. We need to remember the symbolism that bunnies and eggs bring to the holiday, not the games they present to the holiday. Easter is a time to celebrate the resurrection of Jesus Christ. The eggs and the bunnies represent new life; just as through Christ, each of us can be resurrected and have a "new life." In Seminary we were recently studying in 3 Nephi chapter 18 of the Book of Mormon. In verse 7, the word "remember" is used twice, and "remembrance" is used once. Christ is ministering unto the Nephites and telling them of the ordinance of the sacrament. The sacrament symbolizes the blood and body of Christ. We are told in the sacrament prayers (Doctrine & Covenants 20: 77,79) that if we always remember Him, and take upon us His name, we will have His spirit to be with us. I was asked a while ago whether I knew what the most important word in the English language was. Aafter talking to a friend, we decided that it was probably the word "no," just because there is so much in our day and age that we have to say "no" to. But after a discussion, we came to realized that "remember" is one of the most important words. History is recorded so that we can remember the past and learn from it. Planners are used in school to help us remember assignments. Alarms are set so that we can remember important events. Notes are kept so that we can remember our grocery lists. Our lives revolve around remembering the various tasks we have to complete. How fitting that "remember" should be the most important word. And now, my sons, remember, remember that it is upon the rock of our Redeemer, who is Christ, the Son of God, that ye must build your foundation; that when the devil shall send forth his mighty winds, yes, his shafts in the whirlwind, yea, when all his hail and his mighty storm shall beat upon you, it shall have no power over you to drag you down to the gulf of misery and endless wo, because of the rock upon which ye are built, which is a sure foundation, a foundation whereon if men build the cannot fall. We are told, using that most important word, to remember our Redeemer, even Jesus Christ, the son of God. We are not told once, but twice. And in that chapter alone, the word "remember" is used 15 times. Of all things to remember, Christ is the most important. It is through Him and Him alone that we can be saved. There is a new short video that was made by the Church of Jesus Christ of Latter-Day Saints called "Because of Him." It is my new favorite movie, even though it's only slightly longer than two minutes. Every time I watch it, I get chills and can feel the Spirit so strong. It illustrates how Christ lived and died for us, then was resurrected on the third day. It shows how it is because of Him we have what we do in this life. The hashtag #BecauseofHim is being used on facebook, twitter, Google+, pretty much everywhere. I challenge you to use #BecauseofHim in a post, a tweet, something today or tomorrow, followed by a blessing Christ has brought into your life. 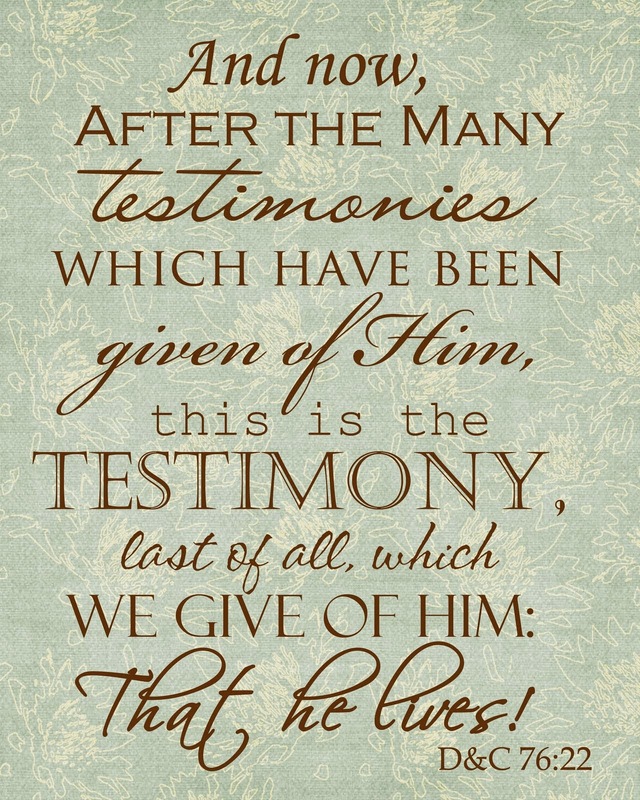 I testify that there is nothing we have, no blessing given to us, that is not because of Him. He has given us everything. We owe our lives to our older brother, Jesus. He atoned for each and every one of our sins and shortcomings. Our pains and our afflictions. If He could do that and remember each one of us, we can remember Him. "Sometimes you'll slip up, and you'll fall, but He'll always be there to catch you." Nothing is more true! There is a story of rock climber, Alan Czenkusch, who was climbing belay with a friend. He slipped and fell, yanking out the three mechanical supports that were holding him up. Because he was belaying, he was attached to his friend by a rope. His friend was able to stop Czenkusch's fall by hugging the rock wall tight enough, and that saved Czenkusch's life. In an interview he said, "Don saved my life. How do you respond to a guy like that? Give him a used climbing rope for a Christmas present? No, you remember him. You always remember him." Christ saved our lives. We need to always remember him. Know that as we climb up our spiritual rock walls in life, we climb in belay with the Lord. If we fall and our supports come out, He will spread his arms and catch us. How can we thank Jesus Christ? We always remember him. This Easter, know that the holiday reaches beyond the fluffy rabbits and colored eggs. Know that it is a celebration of our older brother, Jesus Christ, the one who saved our lives.